Presidential candidate Barack Obama’s mantra for change in economic policies amounts to this: a huge increase in redistribution of income at the hands of the federal government. While Obama refers to this as a “net” tax cut, raising taxes on the top 5 percent and lowering taxes or increasing outright benefits for the other 95 percent simply amounts to an indisputably massive increase in redistribution and ultimately very little meaningful change. To hear Obama and other Democrats describe our current policies, one might think that we do very little to help the poor and disadvantaged. But Americans already transfer more than a trillion dollars a year to low-income households. That’s a lot of money. Before we endorse Obama’s agenda of more of the same, shouldn’t we ask him what benefits a trillion dollars a year have yielded so far? Has that money reduced dependency? Has it solved the problems associated with poverty and inequality? Are more disadvantaged children being raised in stable two-parent families today than 50 years ago? Since Obama believes that “in America, prosperity has always risen from the bottom up,” he should be genuinely concerned with imposing higher marginal tax rates on non-rich Americans. But economists will be more concerned with the higher rates on that top 5 percent because we know that the “rich” play a crucial role in financing the economy’s investments and new business start-ups and in producing the technological innovations so critical to improving our prosperity. Higher marginal tax rates on the “rich” are certain to reduce the contributions they make to the well being of all Americans. 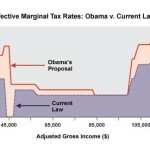 Increasing marginal tax rates as Obama proposes may in the short run improve the material well-being of lower income Americans (at the expense of higher income Americans), but in the long run it will lead to slower economic growth and lower incomes for most people in the future. Economic research suggests that our current redistributive policies have already reduced the average American’s before-tax income by 25 percent. This is the hidden cost of redistribution that is well documented in economics literature, but rarely acknowledged in media discussions. That cost will become larger in the future if Obama’s economic agenda is put into place. Continue reading, Obama’s Economic Agenda: This Is Change? This entry was posted in General, Interesting, Politics and tagged obama, Politics, redistribution, taxes on October 28, 2008 by Scott.